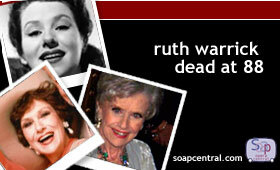 Film legend and original All My Children cast member Ruth Warrick (Phoebe Wallingford) passed away on Saturday, January 15th at 12:15AM in her Manhattan home. Official reports list the cause of Ms. Warrick's death as complications from pneumonia. She was 88. Born June 29th, 1916 in St. Joseph, Missouri, Ms. Warrick moved to Kansas City while she was in high school and later attended the University of Kansas City. A promotional tour brought her to New York; her interest in acting brought her to the Mercury Theater, headed by Orson Welles, with whom she ultimately headed for Hollywood. Ms. Warrick's launched her illustrious film career with her debut as Emily Kane in Welles' 1941 classic, "Citizen Kane." To mark the 50th anniversary of the film, recently named one of the top ten films of all time, Warrick was honored with a caricature on the wall of famed New York Restaurant, Sardi's. "Citizen Kane" was Warrick's entry into Hollywood and it was followed by almost two dozen other movies over the next decade, including "The Great Bank Robbery," "Song of the South," and "Driftwood."